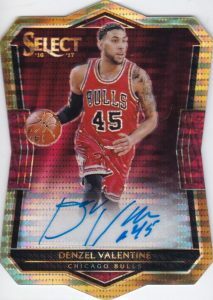 Par for the course, the 2016-17 Panini Select Basketball checklist is again drenched in Prizm goodness. Featuring distinct looks, crazy parallels and lot of hits, every box totals three autographs or memorabilia cards. Just like in 2015-16, the large base set of 300 cards is separated into three groups. The most common aspect, Concourse covers the first 100 cards (#1-100), while more rare Premier Level adds 100 more cards (#101-200). 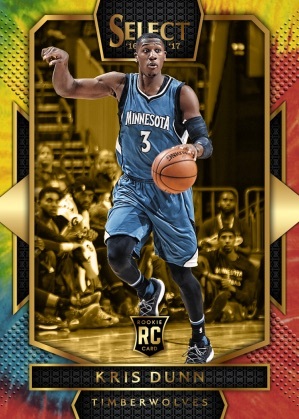 Courtside is the rarest of the set, offering the final 100 cards (#201-300). Prizm parallels such as Purple and Tie-Dye bring a low-numbered chase with print runs of 299 and lower. 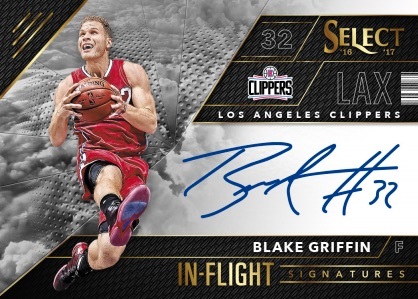 Issued with several different themes and designs, 2016-17 Panini Select Basketball autographs are led by the on-card Signatures, Rookie Signatures and In-Flight Signatures. 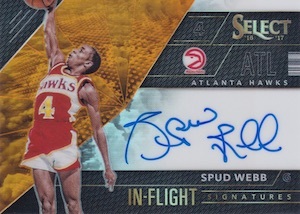 The latter insert naturally highlight the players who spend much of their time in the air. Other options include sicker Die-Cut Autographs for veterans and rookies. In addition, signed sets are mirrored by limited Orange (#/60), Tie-Dye (#/25), Gold (#/10) and Black (1/1) Prizm parallels. 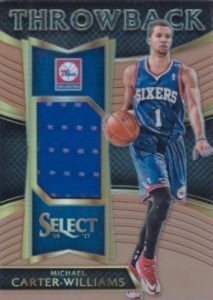 Also part of the hits, 2016-17 Panini Select Basketball brings several relic inserts into play. 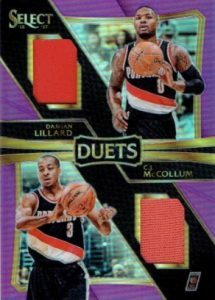 Throwback Memorabilia is a 50-card set that revisits the earlier teams for prominent players, while Duets, Select Swatches and Sparks inserts are some of the other relics to collect. Product Configuration: 5 cards per pack, 12 packs per box, 12 boxes per case. These are mock-ups and not final images. Contents and designs subject to change. 100 cards. Shop Concourse cards on eBay. PARALLEL CARDS: Silver Prizm, Tri-Color Prizm, Blue Prizm #/299, Maroon Prizm #/175, White Prizm #/149, Orange Prizm #/60, Tie-Dye Prizm #/25, Gold Prizm #/10, Green Prizm #/5, Black Prizm 1/1. 100 cards. 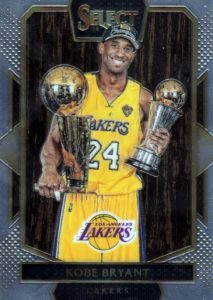 Shop Premier cards on eBay. PARALLEL CARDS: Silver Prizm, Tri-Color Prizm. DIE-CUT PARALLEL CARDS: Light Blue Prizm #/199, Purple Prizm #/99, Neon Yellow Prizm #/75, Tie-Dye Prizm #/25, Gold Prizm #/10, Green Prizm #/5, Black Prizm 1/1. 100 cards. 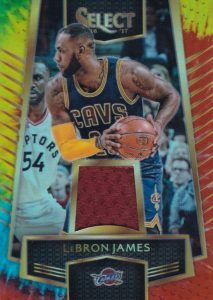 Shop Courtside cards on eBay. PARALLEL CARDS: Silver Prizm, Copper Prizm #/49, Tie-Dye Prizm #/25, Gold Prizm #/10, Green Prizm #/5, Black Prizm 1/1. PARALLEL CARDS: Orange Prizm #/60, Tie-Dye Prizm #/25, Gold Prizm #/10 Black Prizm 1/1. 34 cards. Serial Numbered #/299. Shop on eBay. PARALLEL CARDS: Orange Prizm #/60, Tie-Dye Prizm #/25, Gold Prizm #/10, Black Prizm 1/1. 60 cards. Shop on eBay. PARALLEL CARDS: Pulsar #/60 or less, Scope #/49 or #/25, Mosaic #/10, Power 1/1. View specific parallels with the full spreadsheet. 39 cards. Serial Numbered #/199. Shop on eBay. 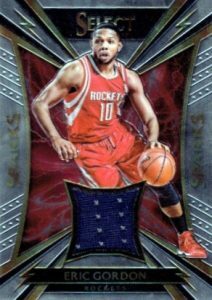 PARALLEL CARDS: Pulsar #/99, Scope #/49 (No McCaw), Mosaic #/10, Power 1/1. PARALLEL CARDS: Purple Prizm #/99 or #/78, Copper Prizm #/49, Tie-Dye Prizm #/25 or #/10, Gold Prizm #/10 or #/5, Black Prizm 1/1. PARALLEL CARDS: Purple Prizm #/99, Orange Prizm #/60, Tie-Dye Prizm #/25, Gold Prizm #/10, Black Prizm 1/1. 64 cards. Shop on eBay. 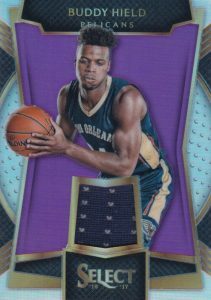 PARALLEL CARDS: Purple Prizm #/99, Copper Prizm #/49, Tie-Dye Prizm #/25 or less, Gold Prizm #/10 or less, Black Prizm 1/1. All subjects not included in each parallel. View specific options with the full spreadsheet. PARALLEL CARDS: Purple Prizm #/99, Copper Prizm #/49 or #/48, Tie-Dye Prizm #/25 or #/21, Gold Prizm #/10, Black Prizm 1/1. No Brogdon in the Base set. One of the top rookies and he doesn’t have a base rookie. Don’t worry you will find plenty of Malik Beasley!!! Plain game used needs to die out. Football has the right formula for this product, basketball absolutely blows. Look at the hits for football, auto patches, team logos, name plates, etc. 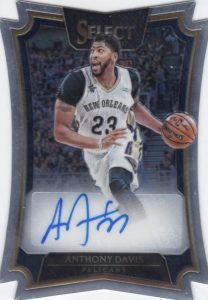 This has diecut autos. One auto? Way overpriced for the content. Way too many D-league rookies in this, too. The cards look great. The only issue is the product is watered down and 2 of your 3 hits will be single color jersey cards. Stick to singles, my friends. 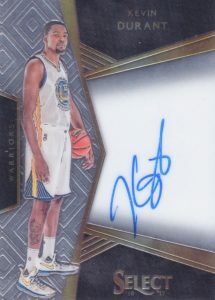 1 auto per box w/ purchase of 3 boxes. No big names memorabilia. Also ran product. Not worth the sticker price. this is just a bad year for basketball rookies. I am staying away from buying a lot of basketball even though its my favorite sport. no matter what they price a box for you cant get a reasonable value. 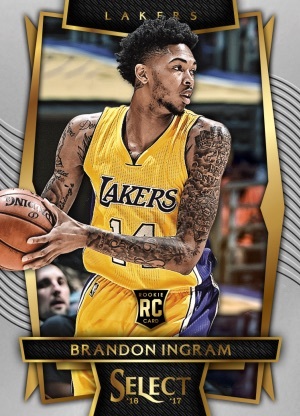 as much as I like exquisite basketball, i’ll probably skip this year due to poor rookie class. but the basketball guys — just cant do it…. it really downgrades the name to do this one way with one sport and differently with this. 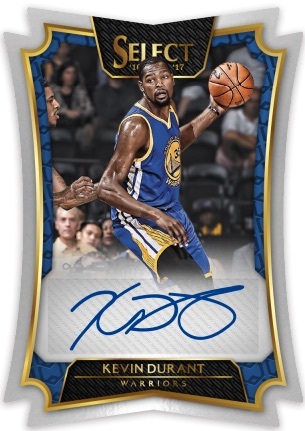 If I am a customer – I expect to get the same kind of cards from either sport and to know I wont get a patch-auto here — not buyin it..literally. 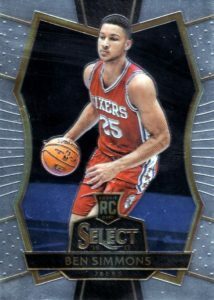 I saw a box of Select at a recent card show with Larry Bird and Magic Johnson on the box so I decided to buy a box. I enjoy buying product where I can get cards of retired hall of farmers. The box says three autograph or memorabilia cards in each box (on average). I only got one auto and one white jersey piece and I didn’t get any hall of farmers. 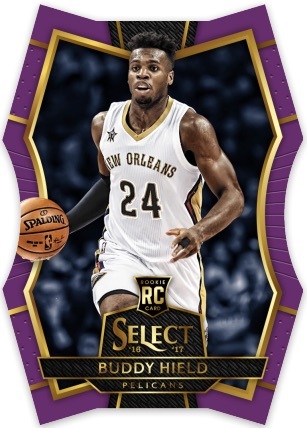 Looking at the checklist on this website unless i missed their names it appears that There are no Larry Bird or Magic Johnson included in the set. What’s up with that? I am a retired senior citizen and I wasted $120 for this box. I’m gonna give this product some love since no one else will. 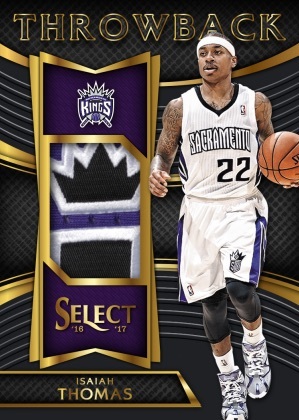 Yes, it is a bit overpriced when your only getting one auto and two plain jerseys. 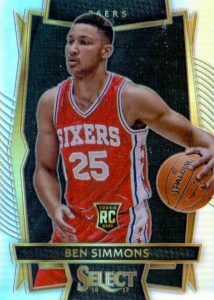 If you hit the right prizm from the court side base set there is money there though. There is big hit potential however so you can walk away up big. The problem is you can walk away down big as well. This product is a classic gamble. I don’t know why everyone says this Rookie class is bad as well. All of the top 10 except for Poeltl has a chance to be special. seen some of the autograph only available in panini reward will they be added to the checklist soon?